Mid-market businesses have begun to regain a profitable footing following the economic collapse six years ago, attributing a primary driver to that of the restructured role of the Chief Financial Officer, CFO. Today, the responsibilities of CFO's have been somewhat redefined. The agenda does not holistically focus on the architecture of capital structure, but rather balancing stakeholder demands and coping with exponential growth in volume, variety, and influx of data models. More modern CFOs are concerned about unemployment, downsizing, acquisition, and market unpredictability—primary contributors to the pitfalls of cost forecasting. A recent study performed by Accenture magnifies changes in the performance of financial functions from the use of advanced software capabilities through the eyes of CFO's, since the U.S. recession. The survey found CFOs are using powerful enterprise software to address regulatory changes, govern people, fully understand customer changes, and better predict market profitability. 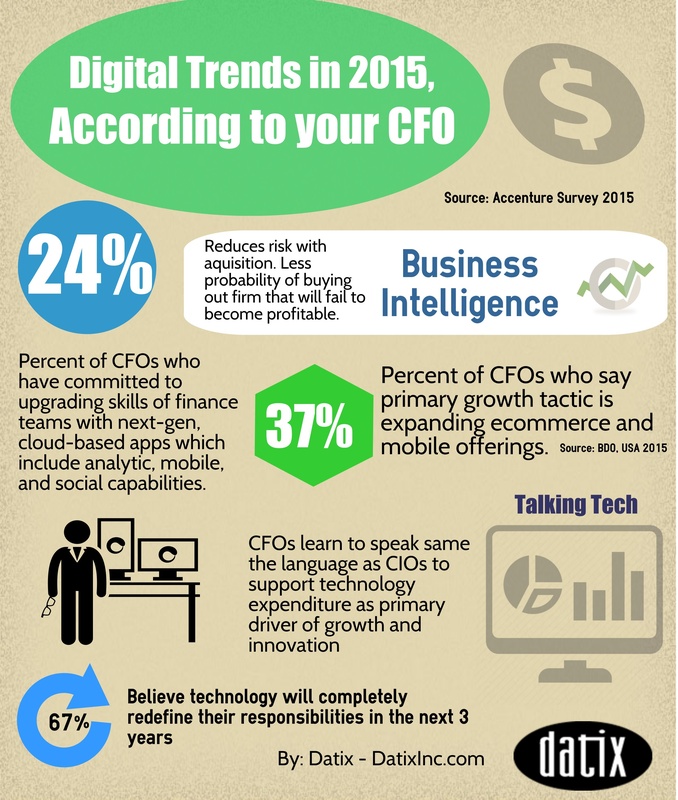 The infographic above illustrates digital trends that CFO's are most concerned about in 2015. More stringent regulatory changes have tightened financial freedom for businesses. The purpose is to shield consumers and stakeholders alike from the reemergence of the economic collapse. As a result; financial, investing, and operational models are highly complex; and CFO's are feeling the struggle. To counter external challenges, CFO's are investing in robust business intelligent (BI) applications integrated into ERP systems. BI analytics grant businesses the ability to predict long term opportunities and benchmarks. CFO's claim BI applications are critical for acquisitions and mergers, in that risks associated with a leveraged buyout or hostile takeover can be realized much sooner, and decisions do not result in the undertaking of an unprofitable business. Going forward, the new responsibilities of the CFO resemble those of an IT Director. CFO's will be more concerned with how the business interprets big data, analytics, and business intelligence information into enterprise software readings. They will focus on the new outcomes of technology investments they've made over the past few years; and the ones they will need to make in the next 3. Today, financial officers are learning to speak the language of the CIO to support their reasoning in why such large capital expenditures are the reviver of growth and innovation in a post-recessive business. Financial executives are investing heavily in cloud and SaaS-based enterprise software in 2015. Accenture mentions 24 percent of CFOs have committed to upgrading skills of finance teams with next generation cloud applications; which include mobile, analytic, and social capabilities—or SMAC STACK—in the survey. 37 percent of respondents claim heavy investing in ecommerce and mobile offerings. As you might assume, the modern CFO seeks to attribute the firm as edgy, and increase product and service accessibility while promoting user adoption. According to Accenture, one-third of CFOs will increase spending on SaaS and cloud-computing infrastructure by 25 percent this year. Modern CFO's place a big emphasis on enterprise-wide change management through the use of software in 2015. The ideal is more associated with that of a project manager to that of organizational users. 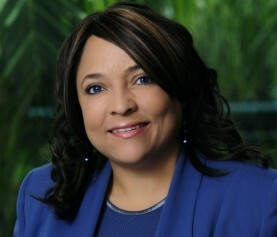 CFO's today are work closely with project teams to ensure these individuals are communicating critical design elements of the software that support important business processes. CFO's want enterprise systems to be highly agile to address complexity on the back in, whilst still supporting stakeholders dealing with less complex tasks on the front. The primary reason for such influence is regulatory guidance. CFOs are highly concerned with users whom perform individualized processes in the system; as this will cause major reporting risks. As a result, a high priority of financial performance is to ensure software reporting functionality and databases automate policies and key metrics across an entire organization to maintain compliance with regulatory agencies. When firms fall out of compliance it prompts risk for fines, negative publicity, and ultimately the loss of market share. However, automating these processes can become extremely complex and inevitably costly. In order for software data models of to incorporate automation of regulatory metrics, optimize user experience, or support a broader organizational strategy, CFOs are recommended to harness the power of business process modeling. This way financial performance can be monitored from end to end of processes and reduce system complexity from an outside perspective. The approach that focuses on processes over software is ultimately much more cost effective. This will be the message the CFO will carry to it's modern organization.